Edition 75. Signed, titled, and numbered 1/75 in pencil. Image size 9 3/8 x 11 7/8 inches (238 x 302 mm); sheet size 11 1/2 x 15 7/8 inches (292 x 403 mm). A fine, clean impression, in dark brown ink, on cream wove paper, with full margins (1 x 2 inches), in excellent condition. 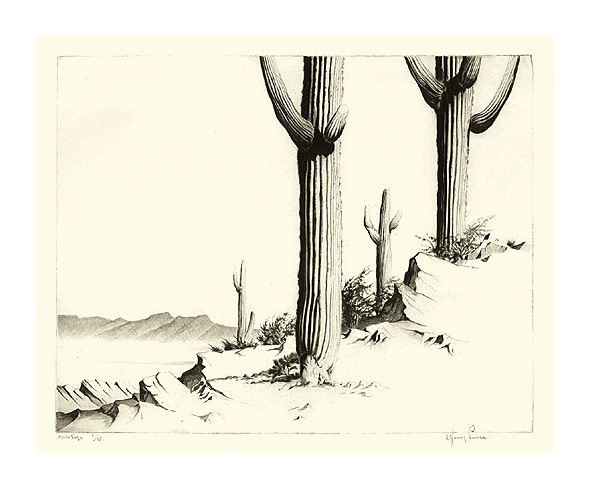 New Mexico = c.1935, Etching. Edition 100. Signed, titled, and numbered 37/100 in pencil. Image size 6 x 8 inches (152 x 203 mm); sheet size 8 3/8 x 9 3/4 inches (213 x 248 mm). 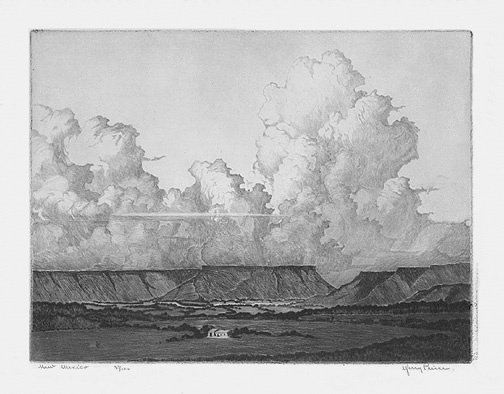 A fine, clean impression, on cream wove paper, with full margins (5/8 to 1 3/8 inches). Tape stains in the top left and right sheet corners, well away from the image; otherwise in excellent condition.